It’s already October and we are in full swing organizing, educating and mobilizing for Election Day. I am sure many of you are too with so much hanging in the balance! Again, nurses find themselves in the familiar role of protecting and defending the ?Affordable Care Act. More and more evidence backs up what nurses already know–the healthcare law works. Thanks to the law, the number of uninsured Americans is expected to decline by nearly half from 45 million in 2012 to 23 million by 2023, according to a recent report from CMS actuaries. A new report from the Kaiser Family Foundation further shows the healthcare law is not only working for the millions who have coverage now, especially parents, but it is also working for the nation by slowing down spending on healthcare costs. Nonetheless, the successes of the healthcare law does not mean the “Party of No” has given up on making Obamacare a polarizing issue in the midterm elections. Make sure you check out the 2014 Healthcare Law SEIU Member GOTV Toolkit to use for member outreach and education in advance of the election. Palmer is actively involved in improving working conditions and patient care. Currently, she is President of SEIU Healthcare Wisconsin and an Executive Board Member of SEIU. 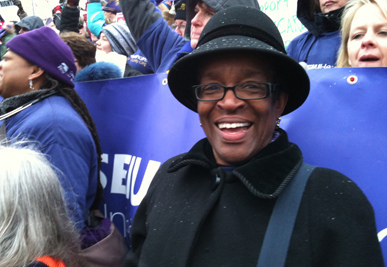 She is a member of the Milwaukee Chapter Black Nurses Association, and a Governor’s Appointee to the State of Wisconsin Minimum Wage Task Force. In addition, she serves as a member of the Democratic Party of Wisconsin Board, the UWHCA Public Authority Board of Directors and the Wisconsin Citizen Action Board of Directors. This entry was posted on Monday, October 13th, 2014 at 4:12 pm. You can follow any responses to this entry through the RSS 2.0 feed. You can leave a response, or trackback from your own site.